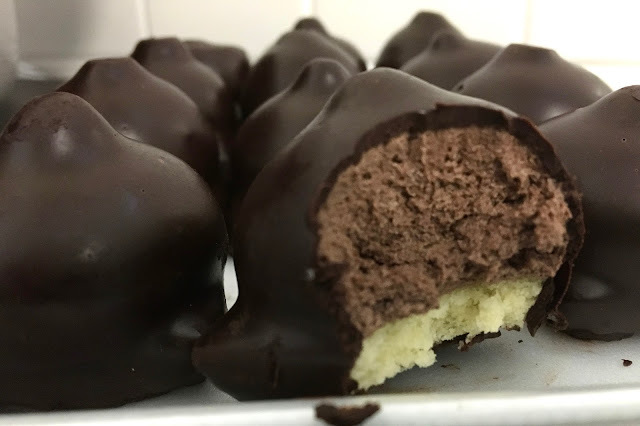 Lilly's Bake Shoppe products are gluten and dairy-free, but do contain eggs and nuts (depending on the product). They are certified Kosher. As with any gluten-free product. Make sure to read the label to make sure the product aligns with your dietary restrictions. I'll start first with the shadow cake, which is absolutely jaw-dropping in it's beauty. Sure to be the focal point of any gathering, it's artistry is undeniable. 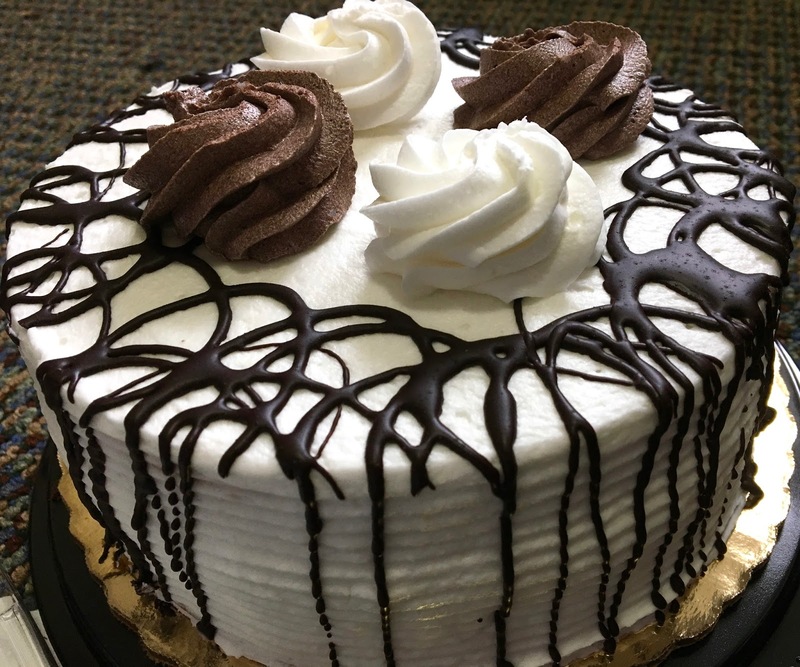 It's rare you can go to a grocery store and just buy a cake without special-ordering, so I relished this small experience of normalcy that is so often denied to gluten-free eaters. The cake features two layers- a chocolate and vanilla one- separated by a layer of fluffy chocolate mousse. Surrounding the outer edges is a white frosting, topped with a chocolate drizzle and chocolate and vanilla frosting rosettes. 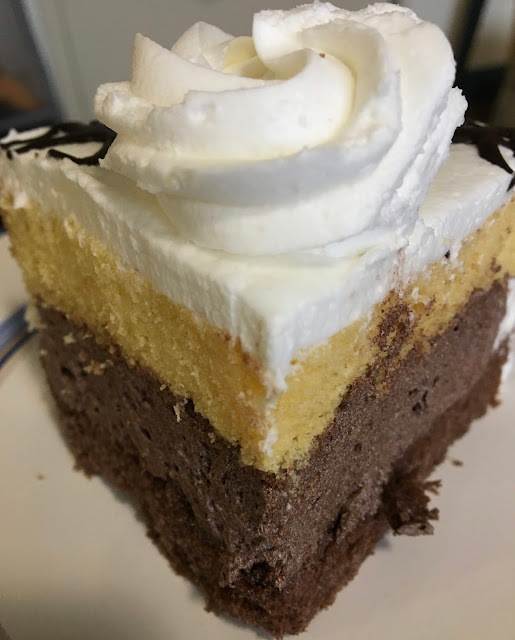 The frosting is thick and sweet, the mousse dreamy, and the combination of flavors was a 50-50 division of chocolate and vanilla. My only complaint was that the cake portion was a bit dry, but no worse than I have experienced at other gluten-free bakeries. For a shelf-stable cake, it more than meets my criteria for a delicious cake. Red/Yellow/Green cookies: These macaron-like cookies featured fruity, soft cookies with a berry jam in the middle. They were sweet and had a nice contrast of chocolate and nuts on their exteriors. Cashew brittle: Nutty, chewy, and addicting, the cashew brittle squares were my favorite of the box. They were not too sticky or crunchy but provided a nice texture and irresistible cashew butter flavor. Chocolate cookie: Similar to the red/yellow/green cookies, this lone cookie featured two soft chocolate cookies with a thick, decadent, fudgy filling inside. If the brittle was my favorite, this cookie definitely took second place. It was decadent and I wished there was more than one in the box. Coconut macaroon: Sticky, fragrant, and bursting with coconut flavor, these were flavorful and were in the greatest proportion. I am not a macaroon fan, so I ended up giving them away to a friend. Chocolate-covered macaroon: These cookies are the same as the ones above, but coated in a thick dark chocolate. Just as with the macaroons, I did not like these- but it's more due to my tastes rather than the cookies themselves. The third product I tried was the seven layer cake, which featured a picture-perfect layering of vanilla cake with chocolate mousse with a thick chocolate frosting exterior. 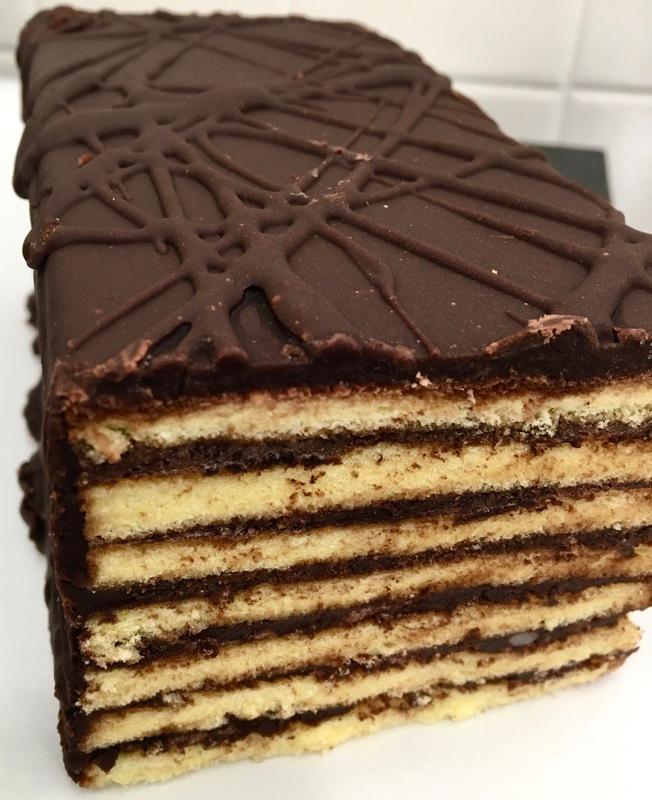 Similar to the shadow cake, this cake had a similar flavor profile, but the chocolate definitely outweighed the vanilla. I like the fudge-like taste and texture of the outer frosting. What I love about Lilly's Bake Shoppe is that their products are delightful and visually appealing in addition to tasting good. Not too sickeningly sweet, the flavors are authentic and satisfying. 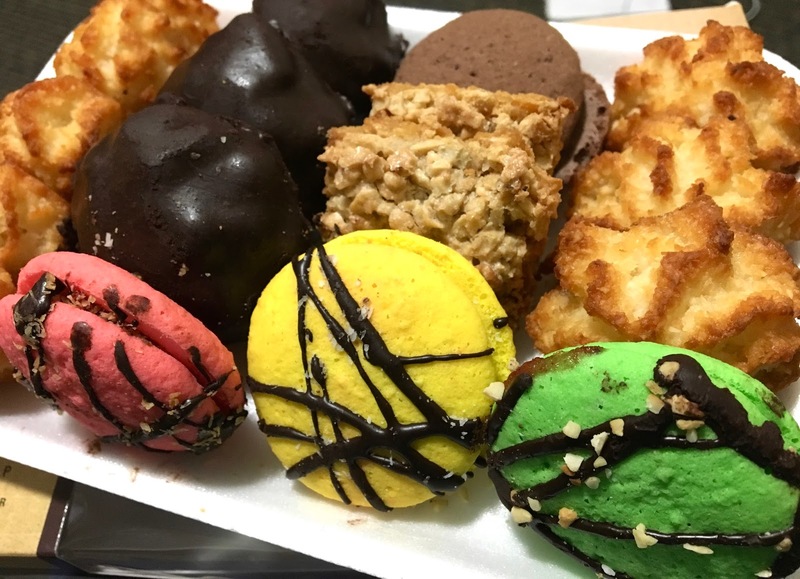 They are reasonably priced and serve several people, so they are ideal for celebrations and sharing with friends and family. The cakes freeze well, which I definitely took note of to stock up and have a freezer supply available. The cakes and cookies have a shelf life of about a month. They are shelf-stable and do not need to be stored in the refrigerator. I found Lilly's Bake Shoppe products in the Hunt Valley, MD Wegmans. Smaller products are in the $8-$10 range. The cake was $19.99. Lilly's Bake Shoppe products can be purchased online at their website. 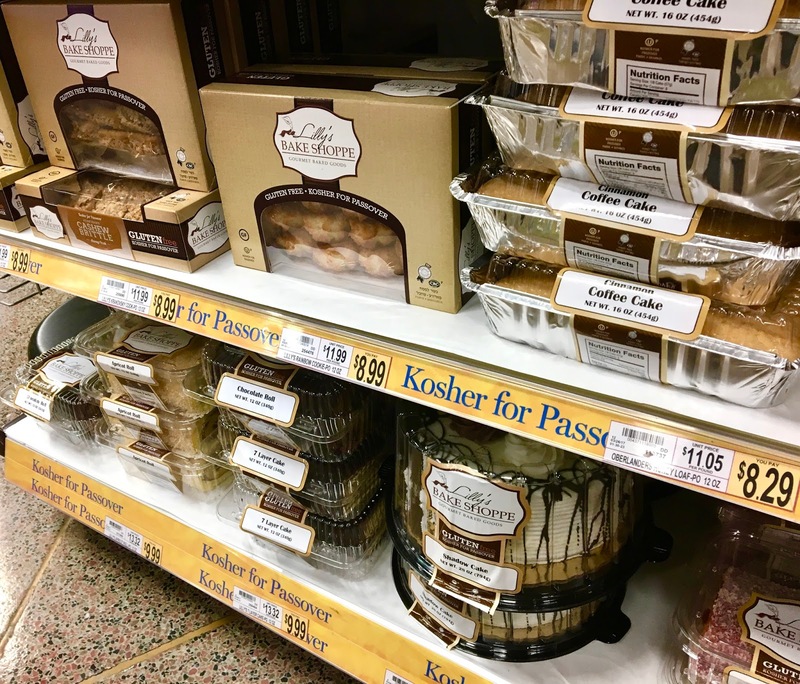 Update 4/23/17: I was able to swing by Wegmans a couple days before Passover ended to pick up a couple more varieties of Lilly's products to sample. 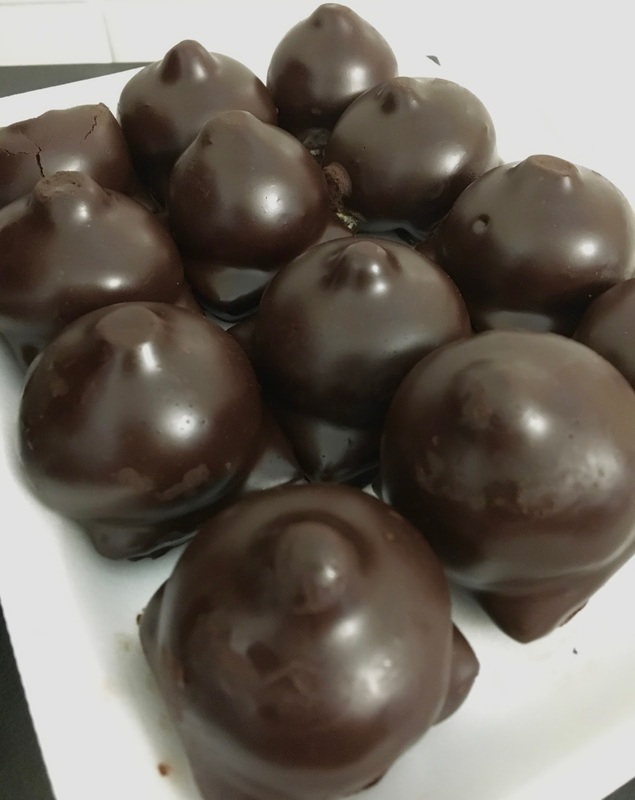 The bon bons were simply delightful, coated in a fudgey chocolate with an interior of yellow cake and chocolate mousse. They are three-bite sized, and are packaged in a dozen. I liked the combination of textures and flavors and found the treats perfect for a quick pick-me-up. I also picked up the cinnamon coffee cake, which I have to admit was my least favorite product so far. 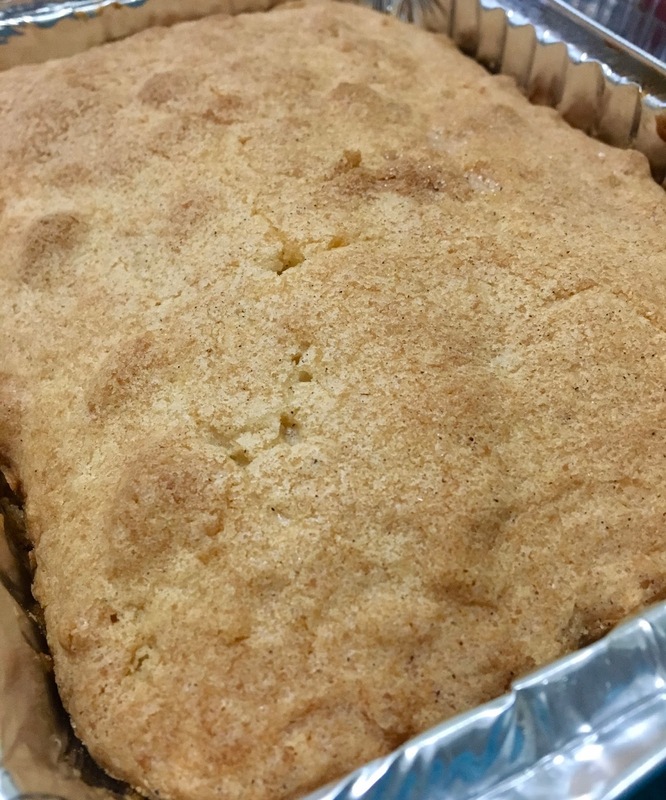 Dry and crumbly, it didn't remind me of coffee cake, which I think of as moist and cake-y. Although promising a cinnamon taste in its title, the only cinnamon I detected was on the surface, the cake itself was rather bland. I wonder if the one I selected was expired, but I had to toss most of it because it was just too dry to enjoy.